This replacement Torx™ key are for securing Torx™ M3 screws, found on the Arbortech™ Industrail Woodcarver blade #63-IND-FG-100. The package contains one key. 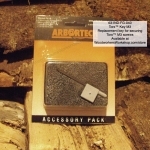 This accessory tool can be used with the Arbortech™ product line of power carving woodworking tools.